That’s a lot of pictures telling many stories in the new book by Barbara Floyd. Part of Arcadia Publishing’s Campus History Series, the work takes a look back at The University of Toledo. Floyd was the perfect person to curate the book. She retired last month as director of the Canaday Center, where she worked 31 years, initially as university archivist and later also as director of special collections for 20 years. And she is a UT alumna. She received a bachelor of arts degree in journalism, a master of arts degree in American history, and a master’s degree in public administration from the University. Scott donated 160 acres of land to serve as an endowment for the Toledo University of Arts and Trade. While the school failed, it was resurrected in 1884 by Scott’s sons, who gave the remaining assets to the city to create a manual training school. “By 1909, the institution was becoming a full-fledged university, but struggled financially and needed a permanent location,” Floyd said. When Dr. Henry J. Doermann became president of the University in 1928, he began planning for a new campus. A $2.8 million bond levy was passed that November, less than one year before the Great Depression. A photo shows Doermann at the 1929 groundbreaking ceremony for University Hall. “President Doermann selected the Collegiate Gothic design elements of the great universities of Europe because he wanted the architecture to inspire students,” Floyd said. University Hall with its iconic tower and dual courtyards continues to be one of the most photographed landmarks in Toledo. Images chronicle the University’s growing campus and burgeoning student life, which flourished even more when UT joined Ohio’s higher education system in 1967. There was a lot to celebrate in 2006 when UT merged with the Medical University of Ohio. At the time, it was estimated the new entity would have a $1.1 billion impact on Ohio’s economy. A few pages also commemorate when UT was in the national spotlight. A smiling Chuck Ealey, the quarterback known as the “Wizard of Oohs and Aahs” who led the Rockets to a 35-0 record from 1969 to 1972, is in the book, along with a shot of the men’s basketball team playing Indiana in the inaugural game in Centennial Hall, now called Savage Arena. UT won, 59-57, with a basket at the buzzer to end the Hoosiers’ 33-game winning streak. And the women’s basketball team is shown celebrating its 2011 WNIT Championship. 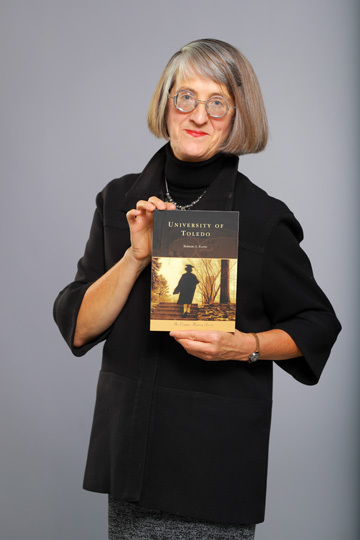 “University of Toledo” is $21.99 and available at the Barnes & Noble University Bookstore and online book retailers. This entry was posted on Wednesday, December 20th, 2017 at 3:13 am and is filed under Advancement, Alumni, Arts and Letters, Features, Library, News, UToday .